Formed below the earth's surface millions of years ago, tanzanite remained well hidden from the human eye for a very long time. It was only in the year 1967 that the glamorous world of style and fashion, first came into contact with this exotic gemstone. While gems like rubies, sapphires, emeralds and diamonds are found in more than half a dozen locations on our planet, all the tanzanite in the world is contained within one small stretch of land. Mount Kilimanjaro in the African nation of Tanzania, attracts thousands of tourists each year. The natural beauty of this clould kissing hill is truly amazing. Millions of year ago, a mineral called zoisite was formed in a small patch of land near the foothills of Mount Kilimanjaro. Centuries ago humans came into contact with some attractive rocks and crystals, rubies, sapphires, emeralds and diamonds became highly sought after. Almost every civilization across the globe wove crystals into their daily life, religion and beliefs. The tanzanian zoisite remained unexplored and probably unknown. It was only in the year 1967 that knowledge about gem quality zoisite came to light. Scientists got involved and nature's secrets unfolded. It became known that, when gem quality zoisite is heated, the brownish green crystal acquires an exotic violet-blue color. It is possible that heat generated by a lightning strike, performed the heating process required for a very few pieces of zoisite. In most cases man has contributedf to complement the beauty of this natural crystal. The gemstone was named tanzanite and is considered to be, one of the most sensational gemstone find in the past century. Tanzanite is rare, a limited mining area implies that resources cannot last too long. No other natural gem can match the beauty, color and sparkle of this African gem. 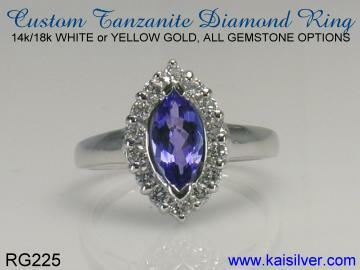 Kaisilver procures rough tanzanite directly from miners, we then heat and custom cut each piece. We can provide a single piece or a thousand matching pieces, you always get good value for your money. The RG225 is a tremendous tanzanite and diamond ring. The design concept is not just pretty, it incorporates features to make the ring sturdier and provides, effective support for the marquise tanzanite gem in the center. A good metal weight forms the foundation of a long lasting jewel. The metal weight for this ring has been optimized for its dimensions and shape. The row of diamonds around the center tanzanite, highlight the beauty of the gem. The diamonds also reduce the chances of the gem getting hit on the edges by physical force. We offer this ring in gold and 925 silver, quality standards for workmanship and gemstone remain the same for both metals. When ordering your tanzanite diamond gold ring, spend a moment considering the gold color that you prefer. We offer 14k and 18k in all three gold colors namely white, pink and yellow. While plating can be provided for the tanzanite silver ring, keep in mind that any plating on silver will wear off after a while. Request for a price quote if you wish to have a 10k tanzanite ring. How To Buy: As the leading online provider of fine custom made jewelry, we recommend that a purchase decision be made only after, complete details have been provided and understood. Review the RG225 Tanzanite Diamond Ring Report and learn about all the options and features for the ring. Our support experts at sales@kaisilver.com will be glad to provide you with clarifications and suggestions, so do not hesitate to get in touch. We can also craft a gold or 925 silver tanzanite ring for you with, your own design concept. Send us images or sketches and we can work the details and pricing together.